Der 41. Theodor-Heuss-Preis wurde in diesem Jahr an James D. Wolfensohn für sein Engagement für die Roma in Europa vergeben. 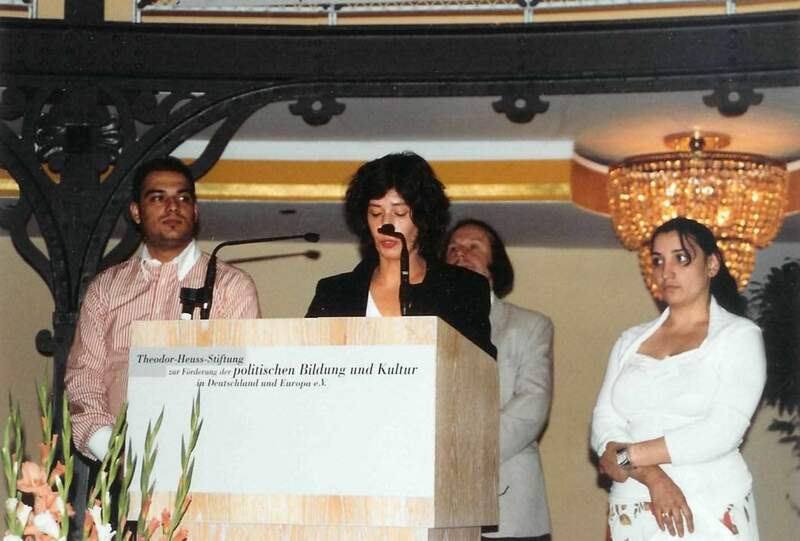 Des weiteren wurden mit einer Medaille der "Pakiv European Roma Fund" aus Bulgarien und die Kindertagesstätte "Schaworalle", Frankfurt am Main geehrt. 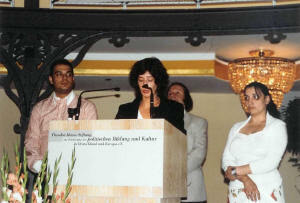 Die Verleihung des Preises und der Medaillen war eingebettet in das Kolloquium "Armut und Ausgrenzung in Europa - am Beispiel Roma"
Minister Pfister, Lord Mayor Schuster, Erich Strather, and please give my best wishes to Heidemarie, members of the Pakiv Foundation, Schaworalle, and most especially Dr. Heuss. Let me thank you and your colleagues in the Heuss Foundation, Christian Petry from the Freudenberg Foundation, and Michael Klett for the great honor that you have done me in awarding me this prize. It is a prize which I accept not just for myself because I was the leader of an organization for some ten years without which I could have done nothing. And so let me accept this in the name of myself and my colleagues at the World Bank who have really done so much in bringing about the objectives that we are working for together. And I must say that I am thrilled to see so familiar faces in the front row here whom I missed for the last twelve months while I have been dealing with the Israel-Palestine-Situation. And I can only tell you if there is anything more difficult than the Roma situation it is the Israel-Palestine-Situation. So, if you want to feel good, come with me some time and maybe you will feel better. The opportunity that I have today to say a few words to you about the issues which I found in confronting the Roma question is a real one. But before I get to that I also want to acknowledge my friend George Soros who financially was able to help us dramatically in our work. George, Hungarian of origin, was very familiar with the issues of the Roma people and, frankly, without him we would not have the financial resources to build the over 40 million Dollars that we needed to launch our activities. 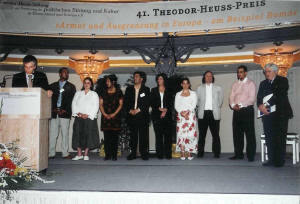 I had the opportunity, as I am sure you would imagine, reading something about Theodor Heuss, your grandfather. And that story itself is a wonderful story and to have a prize which bears his name is truly an honor. Looking at his background and his own efforts to break down prejudice, to bring about equity, to bring about social justice and to lead this nation out of war into a period not only of peace but of high moral and ethical values is truly an achievement of a great man. And I am really proud to have this acknowledgement in his name. But let me bring you back to today because I have been thinking about this speech for two weeks. And I took some clippings from the press and two things in the last six weeks have happened that really struck me. The first is the decision in your own country to release the files of 17 Million people affected during the Holocaust of whom only too many came from the Roma people with probably 500.000 members killed during that dreadful period. I have to say that I think this is an extraordinary courageous and important move by your government. And I really hope that this will give us an opportunity not only to get behind us the analysis but to really build something on which we can move forward together with greater understanding. And the second thing that has happened in this last period, some of you may or may not have seen it, is extraordinarily troubling in terms of the negative side of the issues which are before us. It is the decision taken by the European Court of Human Rights just in March, March 10th, in which the Court decided, and let me read some of this to you, that as a quote a nearly automatic placement of Roma children in dead end schools for the mentally handicapped was addressed by 18 Czech Roma families. And they took it to the Court and they said to the Court: “This is not fair that because of our ethnic origins we should be put into schools of not only disadvantaged but mentally handicapped people”. And on looking into it the Czech government estimated that 75% of Roma children go to these schools and that 90% of the children in Czech mental schools are also Roma. This defies statistical evaluation. It is an extraordinary example of prejudice which, as I have studied now, not only applies to the Czech Republic but goes through the countries which are hosts to the Roma people. And I hope that this decision as the chairman of the Court suggested will go on appeal but it is just amazing that in our time decisions like this can be put down by European Courts with straight face, saying there is no prejudice. I find it killing in terms of the current situation that we in a prosperous Europe should be looking at this as a decision with which we can live and which gets barely a footnote in the newspaper. These are some of the current issues. But in 1999, after I had been President of the Bank for, I guess, four years, I had the opportunity of going with my wife Elaine to Macedonia. And I heard of the issues of the Roma. To me I regret to say the issues of Roma were conjured up by the image of violin playing, of rustic scenes. I had a good image because in Australia were I grew up we were only allowed to see good images just to about everything. That’s why we are so free and easy and positive. But nonetheless when I looked into the issues with this remarkable woman Asvijin Memadowa, and we went to Kosovo together, I came upon the reality of the Roma situation. And this reality is not something that we can deal with in a single meeting important as this is. Or a single decision by the European governments to participate. Or the total funding over 10 years of 43 Million Dollars to deal with the question of 10 million people. Maybe that is 25 cents a person. In terms of the educational needs of at least a million young kids I think it works out at less than a dollar a year that is made available. This is tampering with the issue. This is addressing our conscience without addressing the substance. This is to make us feel good without completely doing good. And it is a step forward because we recognize that this issue is on the table. But it is also an issue of lack of understanding and lack of trust. It is not just an issue of the Non-Roma people working on the subject. It is an issue which I discussed with my Roma friends of the Roma community when coming together. And I see some smiles so I guess you know what I mean. In terms of reaching out also and of taking the responsibility in forming partnerships which over centuries we have not been used to doing. And your parents would have told you no doubt that it doesn’t work. And for them, they have heard it before. But we have to deal with this problem, with this issue now. In Europe you will have 10 Million people of Roma and Sinti origin. You will have 5 Million in the European community, 2% of the community, and growing exponentially. Some estimates put the number of Roma kids in European schools by 2015 in between 10 - 15%. As a declining population in the general community is counterbalanced by an increasing population in the Roma community. This is not something that can be pushed under the rug. This is something that is real. It is something that is human but it is also something we can do something about. And a wonderful thing is that in this lecture with many of you in the audience, all of you were coming knowing that this is the subject. That there is an awakening awareness, that this issue of 2% of Europe can not be pushed under the rug any longer. And it is not just a question of equity for Roma which in itself would be a good reason to do it. It’s an issue of stability for the whole community. These are not people who are behind a wall. These are not people who have no impact on the rest of society. Any more than the non-Roma do not impact the Roma. This is a community. And we can not think of our distinctions between Roma and non-Roma when we are trying to create a positive, an equitable environment moving forward. It is a matter of self-interest and it is a matter of values. It is a matter of belief. And what are we doing? We have a situation where Roma are ten times more likely to live in poverty than their neighbors. We have 1 in 10 Roma children attending preschool. 1 in 10! When all the educational evidence suggests that for human development of our children preschool is the most important time. We are learning this in Germany, we are learning it in the United States and 1 in 10 Roma child has the opportunity of going to preschool. 50-80 percent of Roma in countries of Central Europe study in schools intended for mentally and physically handicapped. Can you imagine that? 50-80%! Can you imagine your children being in that situation? Roma parents can’t send their kids to school in many cases because they don’t have shoes and they don’t have school supplies. Having been in the poverty business for 10 years I’m not making crazy statements to you to win attention. This is the fact. This is the fact in Europe today. It’s not in Central Africa; it is your neighbors down the street. And yet, for me before 1999 - and I believe not since - but for me before 1999 and before my period in the Bank the Roma issue to me was something I saw on television or something that I didn’t have to worry about because it was just another issue and it was a sad issue but you didn’t have to worry about it. The extraordinary thing also is that the Roma have a life expectancy 10-15 years less than the rest of the community that surrounds them. And in most of the places you go there isn’t adequate water, there isn’t adequate electricity and there isn’t adequate power. I am not saying this to be condescending or to draw attention particularly at friends here, many of whom I know to be at the cutting edge and educated. But the leaders of the Roma community, the people that are here and people I have been privileged to know have a job on their hands which they cannot solve without a partnership with the rest of the community. It is impossible! We raised, as I said, over 40 Million Dollars last year after two meetings that we had, one in June/July in Budapest and the second one in Sofia with eight or nine Prime Ministers and Presidents. And we are spending at the rate, since that was for ten years, at the moment of 2-3 million Dollars a year. 2-3 million Dollars a year for 10 Million people. That is 20 Cents a person. Maybe 30 Cents a person. And we feel good because we have a Roma Education Fund, and we now got an office and we have a staff. It is trivial. It is a self to one’s conscience. But it is not the issue. The issue here is one of historic antagonisms, of historic distrust over centuries and the reality that the world is now rich enough that we should be able to deal with issues like this. If we could have 5 Million Dollars more, twice what we are now getting in extra funding from our work we could address the issues of education and health care and at least look at the question of housing and of natural supplies. That is a trivial amount of money for the issues that are before us. We should get five wealthy people here, in the states and in any other place to put up a million each year for five years. It would be done like that if we could get the leadership. Maybe the government, maybe you can set up the first million and get people to come with you. Because what needs to happen now is not the recognition of the issue. It is to take action in a concentrated and coherent and long term basis. This is not a rush of blood to the head to make you feel good. It will not be solved for the rush of blood to the head at a few press conferences. This is a deep problem involving prejudice, involving disadvantage, but also involving opportunity. And it is an issue of morality, it is an issue of what is right and, for those of you in the audience that are my age, it is responsibility for our children. We cannot let the next generation believe that 10 Million people, growing exponentially, can wander around disadvantaged with no hope and think that there will be peace or consider that there is equity and social justice. It is impossible. And for my friends in the Roma community, if we are able to reach out there is a need also for the Roma leadership to respond with honesty, with frankness and also with continuity in terms of addressing these issues not as recipients of charity but as partners. It is not surprising that that trust does not exist. But we have to grasp the decade of the Roams to bring that about. We have to be able to talk to each other and discuss key issues in the same room. Not running off to have coffee each of us and then coming back with a state of position. We have to develop this sort of intimacy and understanding. Because this issue is truly an issue which unites us. You cannot have 2 and then 3 and then 4 % of the population falling behind and have a morally sustainable state or a peaceful state. You cannot have it. So I congratulate the foundation for recognizing this issue and I want to say to Dr. Heuss how enormously grateful I am for the opportunity of representing my colleagues in the World Bank and others interested in this issue to be recognized by you. And I am extraordinarily grateful to do it in the company of the two other organizations that will receive prices today. But we have to focus on the issues of education, employment, health and housing and we have to take these issues seriously and we have to take it not just in one meeting of the foundation but over the next decade. A meeting like this is fabulous. It’s useless if it doesn’t carry on for the next 10 years. And so I thank you for bringing attention to this issue. I thank you very much for the honor you have done me and I look forward while I still have the energy and flow in my body to participating in trying to make this issue one that we can resolve and about we all can be proud. Mein Name ist Sabine Ernst. Ich bin die Leiterin der Kindertagesstätte Schaworalle des Fördervereins Roma in Frankfurt am Main. Daß unsere Arbeit heute mit einer Medaille der Theodor-Heuss Stiftung geehrt wird, betrachten wir als große Anerkennung und Wertschätzung, über die wir uns sehr freuen und für die wir uns zunächst sehr herzlich bedanken möchten. Frau Eleonora Caldaras und Herr Adrian Adam sind pädagogische Mitarbeiter in Schaworalle, Herr Joachim Brenner ist der Geschäftsführer des Fördervereins Roma. Die Kindertagesstätte Schaworalle (Romanes „Hallo Kinder“) ist mittlerweile eine Ganztageseinrichtung für Romakinder im Alter von drei bis sechzehn Jahren, mit Kindergarten, integriertem Schulprojekt, Hausaufgabenhilfe und vielseitigem Freizeitprogramm. Die meisten Kinder kommen aus Rumänien. Schaworalle ist nicht theoretisch entstanden, sondern entwickelte sich Baustein für Baustein. Begonnen hat alles im Oktober 1996, also vor knapp zehn Jahren. Ausgangspunkt der Arbeit waren rumänische Romakinder auf Frankfurts Straßen, die als Bettelkinder, durch Diebstähle etc. aufgefallen sind. Die Beratungsarbeit des Fördervereins Roma, in der ich ein Jahr tätig war, und die Mitarbeit eines Romamitarbeiters schafften den nötigen Vertrauensvorschuss. Auf der Straße, bei Familienbesuchen und in der Beratung sprachen wir die Kinder an. Wir mieteten Räume für vormittags in einem Kinderhaus im Frankfurter Bahnhofsviertel. Schnell entwickelte sich der Vormittag zur Unterrichtszeit, der „kleinen Schule“. Unsere Zielvorstellung war die schnelle begleitete Einschulung in die Regelschule. Am Nachmittag versuchten wir, „unsere Kinder“ in das multinationale Gefüge des Internationalen Kinderhauses zu integrieren. Beides war zu kurz gedacht. So entstand der Wunsch nach einem eigenen Haus, um ganztags, intensiv und vor allem auch mit mehr Kindern altersübergreifend arbeiten zu können. Das Frankfurter Stadtschulamt machte die regelhafte Finanzierung einer Kindertagesstätte, zunächst für 40 Kinder möglich. Diese sichere Finanzierung war und ist ausschlaggebend für die nachhaltige Wirkung unserer Arbeit! Die Elternentgelte und Essensgelder übernimmt pauschal das Jugend- und Sozialamt. 1999 zogen wir provisorisch in eine ehemalige amerikanische Kita am Innenstadtrand, die wir mit den Kindern und Eltern selbst renovierten. 2000 wurde seitens des Staatlichen Schulamtes die erste Lehrerstelle zugewiesen. 2002 bezogen wir dann schließlich die jetzigen Räume in der Frankfurter Innenstadt. Wie sieht es in Schaworalle heute aus? Innerhalb der Hauptstufe gibt es eine Gruppe von 5 Jugendlichen, die sich auf den Hauptschulabschluß vorbereit. Teams der Gruppen bestehen aus den ausgebildeten Lehrern, Romamitarbeitern und Sozial- oder Diplompädagogen. Der Unterricht versteht sich als niedrigschwelliges qualifiziertes Bildungsangebot. Wichtig hierbei sind uns differenzierter Unterricht, Kleingruppen- und Einzelförderung, Einbeziehung der Muttersprache, Computergestütztes Lernen und die Möglichkeit eines qualifizierten Schulabschlusses. Ein Ziel ist natürlich immer noch die begleitete Einschulung in die Regelschule. Um 13 Uhr gibt es Mittagessen, das täglich von einer rumänischen Romni frisch gekocht wird. Zum Mittagessen kommen diejenigen hinzu, die die Regelschule besuchen, im Moment sind dies 13 Kinder. Ab 13.30 gibt es Hausaufgabenhilfe und ein vielseitiges altersübergreifendes Freizeitprogramm. Bildung heißt eben nicht nur Schule, sondern es uns wichtig, den Kindern jenseits aller familiären Sorgen, die Möglichkeit zu geben, „Kind zu sein“. Hierzu gehören auch Ferienprogramme, Feste und die alljährliche Kinderfreizeit. Voraussetzung für all dies ist ein pädagogisches Denken, das sich am Gemeinwesen der Roma orientiert, die intensive Eltern- bzw. Familienarbeit und die gleichberechtigte Zusammenarbeit von Roma und Nicht-Roma. Gerade bei den Kindern, die die Regelschule besuchen, ist die Vermittlungsarbeit zwischen Schule und Elternhaus von zentraler Bedeutung. Elternarbeit findet in Schaworalle nicht in Form von Elternabenden oder speziellen Elterngesprächen statt. Eltern sind in Schaworalle immer anwesend. Eleonora Caldaras, PÄDAGOGISCHE MITARBEITERIN in "schaworalle"
Die gleichberechtigte Zusammenarbeit von Roma und Nicht-Roma ist von großer Bedeutung für die Arbeit. Wir als muttersprachliche MitarbeiterInnen sind Vorbilder für die Kinder und Jugendlichen, schaffen Vertrauen, auch bei den Familien, vermitteln Sicherheit und bieten den Kindern die Möglichkeit, über Erfahrungen und Erlebnisse zu sprechen, die zu unserem Leben als Roma gehören..
Adrian Adam, Pädagogischer MITARBEITER in "schaworalle"
Es ist wichtig, dass die Arbeit mit Roma von der konkreten Lebenssituation und den Erfahrung der Roma ausgeht. Die Hilfe bei existentiellen Problemen wie Aufenthalt, Unterkunft, Gesundheit und Sicherung des Lebensunterhalts bilden auch die Grundlage für eine erfolgreiche pädagogische Arbeit. Genauso wichtig sind Akzeptanz, der Aufbau von Vertrauen und der Respekt voreinander. In diesem Zusammenhang kommt Kultur, Tradition, Identität und Lebenserfahrung der Roma sowie den unterschiedlichen Lebensentwürfen jedes Einzelnen eine bedeutende Rolle zu. Mein Name ist Joachim Brenner. Ich bin der Geschäftsführer des Förderverein Roma. 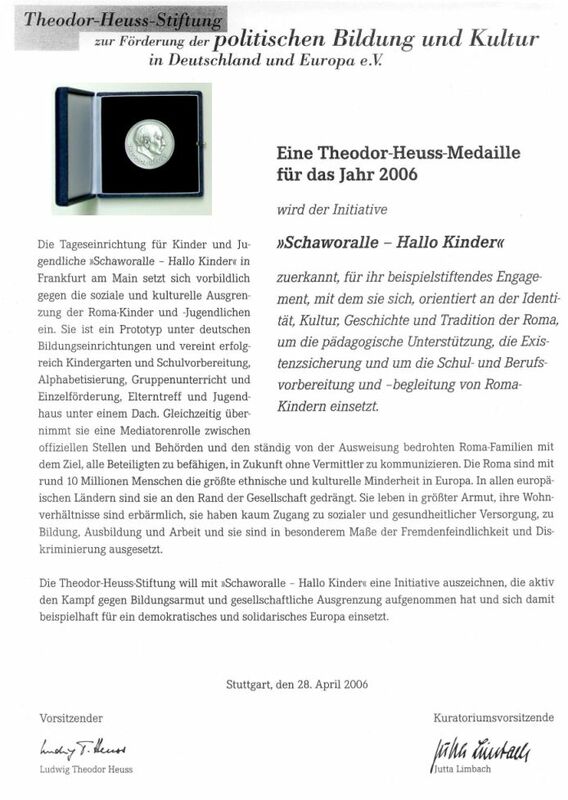 Auch meinerseits nochmals recht herzlichen Dank für die Verleihung der Theodor Heuss Medaille an unsere Kindertagesstätte Schaworalle. Der Förderverein Roma ist seit 16 Jahren in den Bereichen Bürgerrechtsarbeit, Beratung, Information und pädagogische Arbeit tätig. Der Verein ist auf Initiative von Menschenrechtlern, Sozialarbeiterinnen, Lehrerinnen und engagierten Leuten, die alle der Auffassung waren, dass man organisiert besser gegen die Diskriminierung und den Rassismus gegenüber Roma vorgehen kann, entstanden. Neben der Kita Schaworalle sind wir Träger des bundesweit einzigen Berufsbildungsprojektes für jugendliche Roma, wir sind aktiv in der ambulanten sozialpädagogischen Familienhilfe und gestalten unterschiedliche Dokumentations- und Fortbildungsangebote. Mittlerweile verfügen wir auch über ein kleines, aber feines Archiv an Fachliteratur. Für den Förderverein Roma hat die Verleihung der Theodor Heuss Medaille über die Wertschätzung der pädagogischen Arbeit in Schaworalle hinaus große Bedeutung. Im Gegensatz zur Kita, die nicht zuletzt wegen des Engagements von Vertretern des Stadtschulamtes Frankfurter am Main sowie des Jugend- und Sozialamtes gesetzlich finanziert ist - an dieser Stelle nochmals herzlichen Dank an Herrn Dr. Neumann und Herrn Dr. Hubert – unterliegen alle anderen Aktivitäten des Vereins und hier sei insbesondere das Berufsbildungsprojekt genannt, kurzen und prekären Finanzierungsplänen. Planungssicherheit, Kontinuität der pädagogischen Arbeit stehen so ständig zur Disposition. Ich denke, die Theodor Heuss Medaille zeichnet seriöse, sensible, professionelle wie erfolgreiche Arbeit aus und wird unsere notwendige Akquise von Drittmitteln mit Sicherheit positiv beeinflussen. 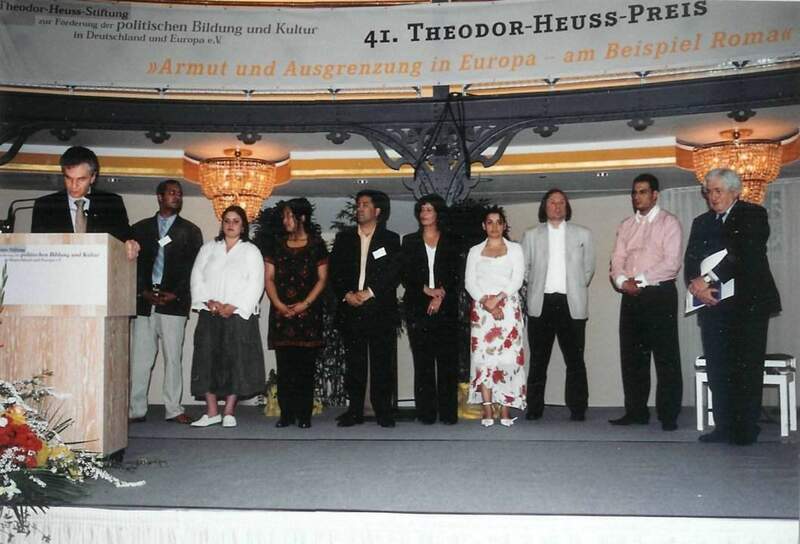 Zum anderen und mit diesem zentralen Punkt möchte ich schließen, bestätigt die Verleihung der Theodor Heuss Medaille und damit auch der Kreis derer, die Preis und Medaille vor uns erhalten haben, den Verein und alle UnterstützerInnen darin, uns weiterhin neben dem Engagement gegen Rassismus und Antisemitismus – eine Grundvoraussetzung jeder vernünftigen pädagogischen Arbeit - gegen die Abschiebung von Roma-Flüchtlingen in Perspektivlosigkeit, Marginalisierung und soziales Elend einzusetzen. Die Ausweisung von Roma, deren Lebensmittelpunkt seit Jahren in Deutschland liegt, konterkariert auf dramatische Weise alle noch so konstruktiven Aktivitäten der Betroffnen. Das öffentliche Engagement für ein Bleiberecht ist deshalb notwendiger denn je.